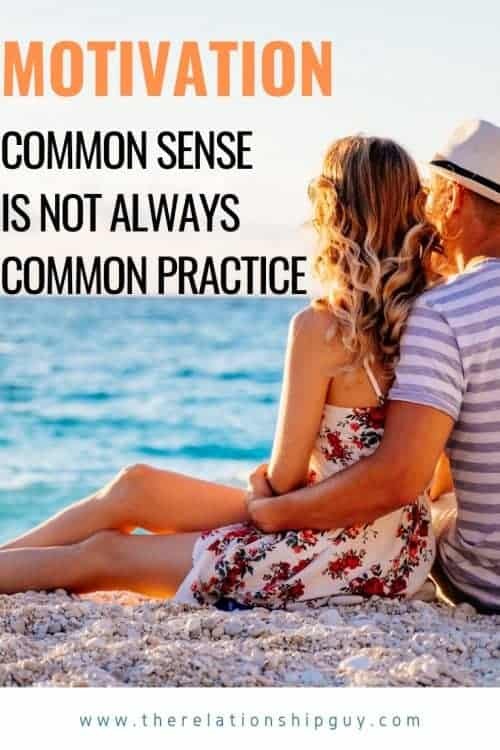 Have you ever wondered why common sense is not always common practice? Here are some of my thoughts. I want to share a few things with you that’s been coming up quite a bit as I am sharing things on social media, like writing blog posts, creating content and all that stuff. Something that’s come out in the comments, but also in my personal relationship coaching work with clients, is this idea that when it comes to solving relationships issues, the solutions aren’t all that complicated. In fact, they are actually very basic. Clients or online followers would tell you they know “this stuff,” but they somehow just forgot about it, or they haven’t been doing it consistently. It’s the same theme that comes up over and over again. Yes, people KNOW what the solutions are, but they struggle to apply those same things they know they need to do to in order to create the results they need or want. And this made me think about why that is. Why is it that even though people know what they need to do, they end up not doing it? They end up doing everything else. And it’s not just limited to relationships either. It stretches into all other areas of life. It’s pretty much the same with anything else, like weight loss for example. I’m pretty sure that if I sat anyone down and asked them about losing weight, they would be able to tell me to eat healthily and work out. So, conceptually, most people KNOW how to lose weight. Yet, even though the average person can tell you what needs to be done in general to lose weight, most of us still end up eating too much bad stuff or overindulging in even worse stuff. We know what we need to do, yet we don’t do. Just because knowledge is accessible and simple to understand, doesn’t mean someone will apply it consistently and effectively. Which essentially turns basic knowledge into complicated information due to our inability to utilise it. We struggle to follow through on even the simplest of things, even when we know how important it is that we follow through. But I’m not talking about motivation in a rah-rah sense. Talk about understanding “motivation” in the right manner in order to generate it more often or at will. Which is what this video is all about. Have a watch and leave your comments below. Here’s the link to the ebook I mentioned.